Public administration policies of the 21st century are devoted to investigating and embracing sustainable avenues toward open government and new and improved citizen participation in all areas of the public sector. Open government is understood to be the mechanism that embraces the ability of citizens to access information available through technological partnerships that generate collaborative and participative dialog between government and citizen stakeholders. According to Sharon S. Dawes’s article, “Government in the Digital Age: A Research and Action Framework for an Uncertain Future,” the open government ideology emerged from the adoption of e-government early in the 1990s and later took root from the forward push of the E-Government Act of 2002. These established initiatives, through policies such as Freedom of Information Act of 1966, paired with the Paperwork Reduction Act of 1995 established a formative framework that is focused on dissemination and delivery of government information through the World Wide Web. 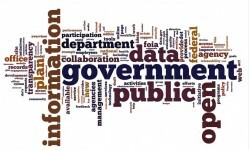 Many levels of the public sector, primarily local, state and the federal government, are devoted to the delivery of services, information on policy mandates and dedication toward transparency of available government information, how this is dispensed as well as how business between citizen stakeholders and government is carried out online. The publication of data and information technology management in terms of distribution. The instruction for agencies to create new cultures that are based on a policy framework that would be beneficial in supporting the principles to be considered as open-government. To further challenge this directive, agency heads looked at areas from which to draw examples referred to historical data and information. This was a good faith effort toward compliance, which unintentionally proved to inhibit current needed outcome or response, as the information generated was outdated or not focused on citizen participation. The intention of the Obama administration is to give citizens access to what government is about and to some degree entertain the option for input where it is deemed needed. The administration had obviously assumed too much in assessing that the public, who embraced advance technology, would also do the same for this open-government initiative. The Obama White House had expected the frequent utilization of the Web technologies and social media with its Web-based tools would facilitate maximum interactions toward open-government goals and outcome. Individual forms works on public projects, campaigning/lobbying or administration appeals. Organizational forms are official citizen committees, special interest groups or citizen groups. Information collection during hearings, government records or nongovernmental documents. Information dissemination is a consideration such as in mass media, correspondence or a variety of local and national publications open government, conferences. The requirement of this federal citizen participation is primarily based on the nuances aligned with our system of American democracy. According to Horace Blake’s article, “Federalism: Reviewing the State of Intergovernmental Relations,” citizen participation is reflected in the First, Fifth and 14th Amendments which guarantee citizens the right to have a free press, exercise free speech, assemble freely with one another, petition their governments for redress most grievances and receive equal treatment under the law in accordance with “due process.” Citizens exercising their constitutional rights become evident with their access to government in the local and state arena where a diversity of groups can be visible exercising this right. The notion of open government and citizen participation has had a variety of effects. However, there is a need for simpler and cleaner decision-making process along with more adequate training of the various agency principals so that training could filter down to those who need to know. There is certainly no room for one-size fits all for all agencies and not all citizens have the same abilities in accessing high technology, which is the prevailing tool in open government. Finally another issue that exists is that most of the laws for citizen participation tend to be outdated. This piece was brilliantly constructed and articulated in a manner that even I could understand. I concour with Mr Blake.